DC Dana: Sticks and Stones May Break Your Bones, but Thoughts Tear ACLs…. " I’ve been talking to friends lately about the power of positive thinking. I think I’m usually pretty good about staying positive, although it might be more that I’m just a good Goldfish Poodle: I’m not necessarily planning a ton of things, just being surprised and excited with whatever comes along. But this idea didn't fully sink in for me until a few months ago, when I was having coffee with a friend I hadn’t seen in a long time. At some point we started talking about skiing, and she launched into a story about her brother. Her brother had apparently hurt himself at some point and tore the ACL in one of his knees. And while he was still rehabbing that knee, he decides to go skiing anyway. Men: it’s decisions like that, that make us females think your kind are simple creatures. Just sayin’. He falls. Right in front of Lynchie. And tears the ACL in the other knee. I mean… who saw that coming? So they have to call their parents and tell them what happened, and after that, Lynchie is a little traumatized, as one might expect. 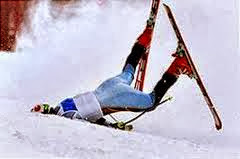 So the next ski season – they try again. So she agrees. “Yes, why would I tear my ACL just because my brother did?” And she takes a lesson. She falls and tears her ACL. So now, when I’m tempted to let my thoughts run wild and be as negative as I feel, I think of this story. Hope might lead to disappointment, but fear can apparently snap ligaments. I’ll take my chances with hope….